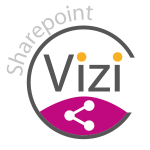 Vizi Sharepoint integrates all diagrams and documents into Microsoft Sharepoint. Access your BPDs,… easy and convenient via a web browser . Vizi Sharepoint provides a secure place to access and store models, documents, and additional information . You have access from anywhere and from any device. Vizi Sharepoint allows you to structure, release, and comment BPM artifacts (Visio models). Sharepoint at a glance: model preview, navigation tree (model structure) and documents with documents. You have access to all relevant information to your business process models. Like a file explorer, a menu tree and a preview of the selected documents are displayed. The corresponding documents are listed below the graphical model view. Navigate quickly with only a few steps through your BPM diagram. Since beginning itp's passion is to develop a userfriendly BPMN tool based on Microsoft Visio to design professional and easy understandable process diagrams. Design, report, document and document management features provides best quality and usability. Announcing Vizi BPM Suite 7 – What’s new? Professional Training On-Demand, Online Training, Classroom Training including certification.